Poet, artist, journalist, rock singer and songwriter, and now memoirist, Patti Smith has led a fascinating life. 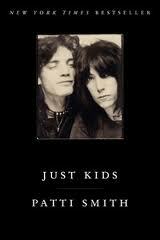 This book is a chronicle of Patti’s recollections of her early life. Arriving in New York City in 1967 at age 20, Patti soon hooked up with Robert Mapplethorpe. Patti and Robert lived together until 1974, residing for some years at the infamous Chelsea Hotel. Their growth as individuals, as artists, and as young adults in the turbulent times at a cultural hot spot makes for fascinating reading. Smith is an ardent and expressive writer. Small luminous moments are juxtaposed against major events and crucial turning points. Part of her purpose is redemptive, as she explores Mapplethorpe’s transition from a young artist to controversial photographer. Robert drifted from art to the occult and Satanism, to homosexuality, and to the SMBD subculture that he documented with photography. Patti’s path led her from drawings to poetry and rock journalism, and then on to leading a rock band. Interspersed with photographs, the book is a map of the times with pins stuck in cultural mileposts: the deaths of Robert Kennedy, Martin Luther King, Jim Morrison, Janis Joplin, Jimi Hendrix, the first moon landing, the Vietnam war, Andy Warhol’s Factory and his shooting, the kidnapping of Patti Hearst, the Manson murders, etc. The reader has arrived at the Omaha Beach of America’s artistic and cultural revolution; its Arlington Memorial of tragedies and deaths give proof of its high cost. Smith recounts particular tarot readings she did for herself and others at critical moments. There are remarks about the famous Weiser bookstore in New York City, a landmark of the burgeoning earth spirituality movement and the “tarot revolution” that took place in the late 1960s and early 1970s. Patti mentions packing her tarot deck as she moved into an apartment with the Blue Öyster Cult keyboardist Allen Lanier in 1974. This is a beautiful recounting of an intimate relationship and coming of age, of paths that intersected and then split when love transmuted into friendship. Smith remained close to Mapplethorpe until his death of AIDs in 1987. This book is a New York Times bestseller and a winner of the National Book Award. Smith is one of the few women who carved a career in the early years of rock ‘n roll, and this book is the storyboard that shows how she was in the right place with the right skills and acquaintances at the right time to do that. Highly recommended as an elegiac memoir for older readers, and as an introduction to the heady yet dangerous elixir of America’s cultural revolution for younger readers.